27 February 2018, NEW DELHI: Holi, the festival of colour is a spring festival celebrated in the Indian subcontinent, mostly among the Hindu communities. The festival signifies the victory of good over evil, the arrival of spring, end of winter, and for many a festive day to meet others, play and laugh, forget and forgive, and repair broken relationships. It is also celebrated as a thanksgiving for a good harvest. It lasts for a night and a day, starting on the evening of the Full Moon day falling in the Vikram Samvat Hindu Calendar in the month of Phalguna, which falls somewhere between the end of February and the middle of March. Holi celebrations start on the night before Holi with a Holika Dahan where people gather, perform religious rituals in front of the bonfire, and pray that their internal evil be destroyed the way Holika, the sister of the demon king Hiranyakashipu, was killed in the fire. The next morning is celebrated as Rangwali Holi – a free-for-all festival of colours, where people smear each other with colours and drench each other. Water guns and water-filled balloons are also used to play and colour each other. Anyone and everyone is fair game, friend or stranger, rich or poor, man or woman, children and elders. The frolic and fight with colours occurs in the open streets, open parks, outside temples and buildings. Groups carry drums and other musical instruments, go from place to place, sing and dance. People visit family, friends and foes to throw coloured powders on each other, laugh and gossip, then share Holi delicacies, food and drinks. 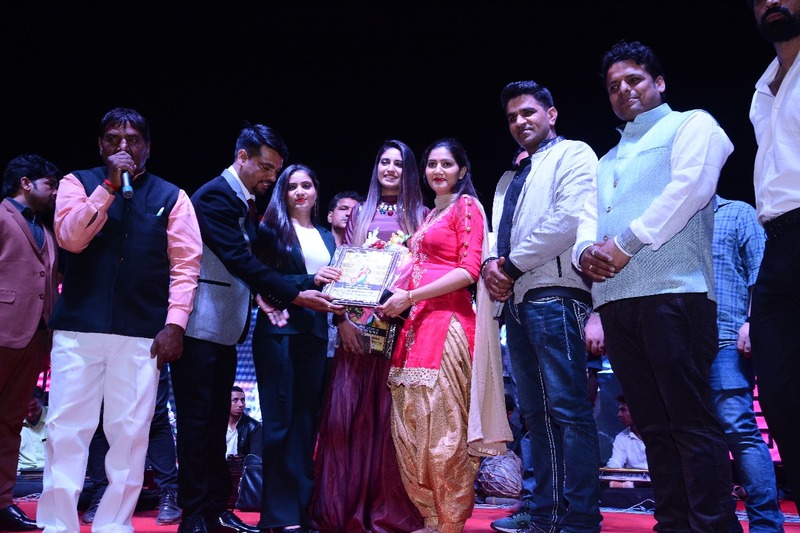 This year on the eve of Holi, the Shiv Valet & Cab Services organized one of the most talkative event in the town, EK SHAAM HOLI KE NAAM, yesterday in the evening at the Major Dhyan Chand National Stadium, India Gate. The performers like Vicky Kajla, Rajesh Pandey and Sapna Choudhary was the main attraction of the celebration. Rajesh Pandey is an Indian Rock singer, Songwriter and Lok geetkar. Rajesh came to prominence in the early age as Rock singer. He gives top ranked rock songs hits. Basically he belongs from Bihar. He can also sings folk, devotional and regional songs. He is very talented singer. He performed so many concerts in Europe. Recently he came to India and writes so many rock songs, bhajans and geets. Rock music is a broad genre of popular music that originated as "rock and roll" in the United States in the early 1950s, and developed into a range of different styles in the 1960s and later, particularly in the United Kingdom and the United States. It has its roots in 1940s and 1950s rock and roll, a style which drew heavily on the African-American genres of blues and rhythm and blues, and from country music. Rock music also drew strongly on a number of other genres such as electric blues and folk, and incorporated influences from jazz, classical and other musical styles. Musically, rock has centered on the electric guitar, usually as part of a rock group with electric bass and drums and one or more singers. Typically, rock is song-based music usually with a 4/4 time signature using a verse chorus form, but the genre has become extremely diverse. Like pop music, lyrics often stress romantic love but also address a wide variety of other themes that are frequently social or political. Vicky Kajla, the Punjabi Haryanvi sensation was stolen the audience’s heart through his famous number “Desi Desi”. The song was actually taken hostage the emotion of the audiences and forced them to dance along. Vicky has proven his huge fan following among the youth of Haryana, Punjab and Western Uttar Pradesh belt, along with the audiences from Delhi. 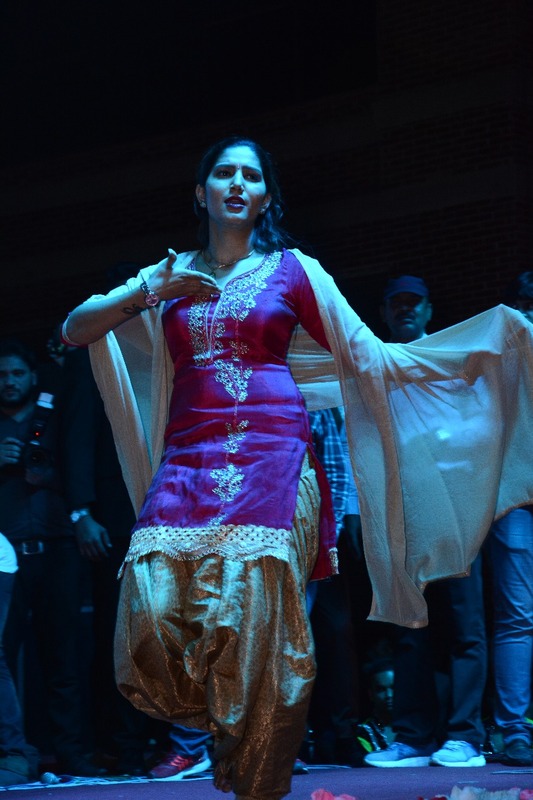 Though the main attraction was Sapna Choudhary another singer from her troupe Radha Choudhary also been proven quite talented Raagni singer, from the community. She has flaunted the so call system of history education by her very strong lyrics of the Haryanvi folk form Raagni, describes that, Gandhi Ji was the not only Hero for India’s freedom struggle and independences. Besides him many other known, unknown martyr were also actively taken part in the freedom struggle, where our education system denied their great sacrifice and only to focus on Charkhha policies of Gandhi. And she ended that, without Subhash Chandra Bose, India’s freedom was impossible. Well, the main attraction of the evening was of course this year’s EK SHAAM HOLI KE NAAM programme was most popular Haryanvi Singer and dancer Sapna Choudhary. As you must be aware that Sapna is famous for to lit the fire on stage through her heart winning performance on stage. Sapna Chowdhary has a huge fan following not only in the capital region Delhi or Haryana, but also she is extremely popular in Punjab, Rajasthan, Uttar Pradesh and Madhya Pradesh. The singer dance entered the popular Television shows Big Boss 11. Spana Choudhary was also like Radha, emphasized the importance to pay honour to the Martyr those who sacrificed their pernicious life for the freedom struggle to India’s independence. And also the army jawans who became victims of terror attack everyday or for the safety of our Motherland. Sapna’s first song was also focused the great sacrifices of Bhagat Singh. Sapna told us, she is very much active in the “ Beti Bachao, Beti Padhao” campaign and also claims now a days there is a good awareness spreads over Haryana about the female child foeticide. She also pleaded to her audiences, besides the usual Holi greetings, that, people should play Holi peacefully. No one should force anyone to play Holi. She also talks about the use of organic colour and most importantly not to waste water. Shiv Choudhary, the Director of the Shiv Valet & Cab Services, described, how his dedication and hard work and the intense support of his wife Lakshmi Choudhary, make possible to build a huge company of manpower. He also describes through this event, his company has entered in the segment of event management, where earning money is not his focus but also to give back something to the society. Making commuting a hassle-free experience is the priority for Shiv Valet & Cab Services Pvt. Ltd. in Preet Vihar, Delhi, one of the car rental agencies in the city. This cab hire service is counted among the leading players in the city. This cab service offers commuters the freedom to rent a cab in a jiffy. This enterprise provides car rental, outstation car rental and sightseeing car rental packages. Its impeccable services have helped this brand emerge as the leading choice for customers to travel in comfort. Aiming to ensure customer satisfaction, they also customised their services to match with the changing preferences of the travellers. This organisation is run and managed by a team of professional and passionate individuals. As a service provider, they have not only made transportation accessible for citizens of Delhi, but also have made commuting more hassle-free and economical. In Preet Vihar, this enterprise has its office at 202, 2nd Floor Plot Number16,17,18 Vardhman Tower on, Near CBSE Building. Undoubtedly it is one of the best taxi services in Preet Vihar, Delhi. This cab service specialises in airport transfers, with pickup available from anywhere in Delhi. They have a large and well-maintained fleet of cabs. Catering to the convenience of the commuters, the pick up service is available round-the-clock. The options vary in terms of availability of air-conditioning, the number of seats in the vehicle and the type of the cab. A user can choose the option that suits their budget and preferences. Conveniently pay for the services in Cash, Master Card, Visa Card, Credit Card.